Back on the farm when I was growing up, there was a twisted, half-dead, gnarly old pear tree that stood sentinel at the head of the vegetable garden. Every year it blossomed and put out a respectable number of pears. Since this tree didn’t have a pollinator within 40-50 feet, it most likely was a E	uropean pear (Pyrus communis), not an Asian (Pyrus pyrifolia) or Oriental hybrid since these latter two are self-sterile and need a pollinator. Full-grown pear trees can get up to 20 feet tall and wide so they need some space. There are options for the small backyard grower in USDA Zones 5-9, however. Semi-dwarf trees top out at 12-18 feet and dwarf pear trees can be as short as 8 feet. These smaller varieties often will produce just as many pears as the standard size. Pear tree care is simple. It involves fertilizing once a year, in springtime, and minimal pruning in winter to maintain an open crown so that sunlight reaches inside the branches. If you are planting more than one fruit tree in your backyard garden, space dwarf trees 8 feet apart and semi-dwarf trees 12 feet apart. When planting a pear tree, select a site in full sun with plenty of room for the tree to grow upward. Always look for overhead power or telephone lines before you choose a planting site. The soil should be a bit on the acid side, pH 7 or lower. 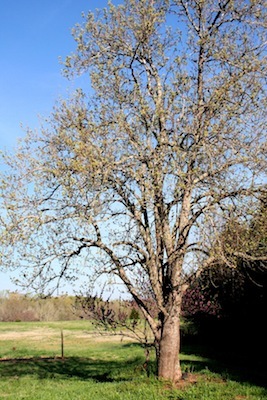 In warm and humid areas, select trees bred for fire blight resistance. Get your pear tree into the ground before it leafs out. Place mulch around the top of the root ball to hold in moisture but keep the mulch away from the base of the tree trunk. Mulching too close can cause rot and can give mice and voles hiding places to munch on bark. Dig a hole wide enough to spread the roots out but only as deep as the root ball and, if there is one, with the graft (a swollen area near the root ball on dwarf and semi-dwarf trees) 2-3 inches above the soil. If you dig the hole too deep, the settling of the tree after planting can result in a short life since planting too low is a huge contributor to trees dying for no apparent reason a couple of years after planting. Fruit drop (all or most of the pears drop from the tree before they mature) can happen if the tree sets too much fruit. Too much heavy fruit can also break branches. 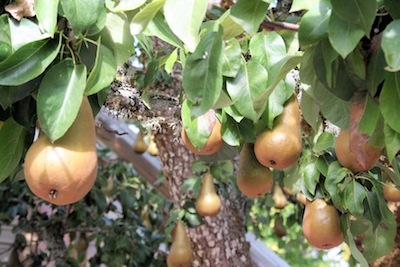 If there is an over abundance of pears, remove all but the largest pear from each cluster. Remove any clusters that are closer than 6 inches. This will make it easier for a young tree to support a crop and will aid in getting larger fruit as the trees establish. Check with your state’s University Extension Service for help in identifying and managing any disease or insect problem. You should enjoy fresh pears from your trees 3-5 years after you get them in the ground.